Move aside, Rice Krispie treats! You've never tasted crisp rice marshmallow treats like these before. The Crispery's Crispycakes taste even better than homemade, if that's even possible. I had my first Crispycakes experience in May 2014 at the Sweets and Snacks Expo in Chicago and I couldn't believe that a crisp rice marshmallow treat could taste as good as they did. At the show, I was able to taste their lemon-flavored variety and it absolutely floored me. The flavor was perfectly sweet, but not too intense. It was honestly one of the best desserts I've tasted in a long time. This time, my fellow editors and I were able to try a few of The Crispery's most classic Crispycakes flavors. Our gift box included "Cocoa Concoction," "Drizzled White Chocolate," "Rainbow Sprinkles," and "Chocolate Candy Buttons." The two candy-topped varieties are really festive and look great in the gift box. Plus, the candies give the Crispycakes a really pleasing texture. The white chocolate drizzle on the third variety really adds a great flavor depth to the sweet taste of the marshmallows. While everyone loved each of the varieties, the "Cocoa Concoction" Crispycake went the quickest. We loved how it had a chocolate mousse-like marshmallow layer in the center. It was so incredibly fluffy and added an extra pop of chocolate flavor to every bite. Now that I've tasted multiple varieties of Crispycakes, I don't think I'll ever think of crisp rice marshmallow treats the same way ever again. 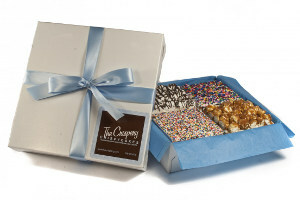 It's a good thing that I can order cute gift boxes full of Crispycakes from The Crispery whenever I have a craving. I truly can't recommend these treats enough. Chance to Win a Maverick Digital Candy and Fryer Thermometer! Chance to Win a Farberware 3-Piece Bakeware Set! Enter to Win a Chill Factor Ice Cream Maker! Enter to win a free Baking Mat! Enter to win the Frieling Layer Cake Slicer Giveaway! Enter to Win a Set of PrepWorks Collapsible Measuring Cups! Enter for a chance to win the CucinaPro Manual Cookie Press!